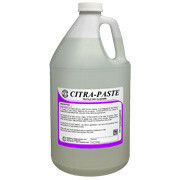 Chemical Consultants’ Citra Paste is a plastisol ink wash that is a water soluble, drain safe ink degradent formulated for the removal of screen printing inks. 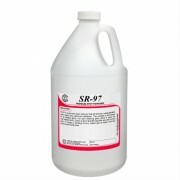 This product is a semi-viscous, water soluble cleaner. 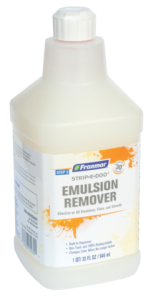 It is designed for the removal of a variety of inks without attacking the emulsion. 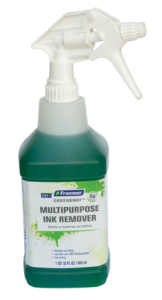 CITRA-PASTE’S top priority is plastisol and water based inks. Use one of the following applications. I Card excessive ink from the screen. Apply CITRA-PASTE to the ink side of the screen. Use a non-abrasive scrub brush or pad to agitate both sides of the screen. Starting at the bottom of the screen, high pressure water rinse all ink residue from the screen. II For saving the artwork (stencil), use above application, but use a low-pressure flood rinse in place of a high pressure rinse. *Check with your local sanitation district rgarding limitations on inks that are to be rinsed before washing them into drain.